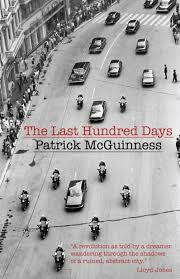 The Bangor Reading Wales group met this Wednesday to discuss ‘The Last Hundred Days’ by Patrick McGuinness. It seemed we were breaking tradition by not reading something strictly Anglophone Welsh. Whilst we’re all about Welsh Writing in English at Reading Wales, we thought it would be interesting to broaden our horizons. When questioned ‘To what extent is this a Welsh novel?’ one reader said he would review it as an English novel, rather than Welsh, based purely on the fact the main character hates his father! Joking aside, Patrick lives in Caernarfon and this book (his first novel) was published by Welsh publisher Seren and won Welsh Book of the Year in 2011. The book was also on the long list for the Man Booker Prize and the short list for the Costa First Novel award in the same year – so were we to believe the hype that surrounded ‘The Last Hundred Days’ which was so well received in Wales and further afield? The group enjoyed an engaging and in-depth discussion about many aspects of the novel, its characters and the time period it portrays. Something all of the readers agreed on was how it was historically interesting and informative. The novel follows the life of a British graduate who is offered a job at Bucharest University – a job he never actually interviewed for. The unnamed narrator arrives in Romania in what is about to be the last hundred days of Ceausescu’s regime. This is an evocative account of a communist dictatorship crumbling from within in the late1980s. We all agreed we had read (or were at least aware) or novels that deal with the politics that surrounded the fall of communism but not one which focused specifically on Romania. McGuinness vividly describes the sinister and seedy last few months of Bucharest under Ceausescu, from the Monocom supermarkets (where you can buy only one of every item) to the constant lying and deceit endured between even the closest of ‘friends’. As the youngest of the group I found it documented a time in history which still does not feel like it has quite become history because it is in the recent past. This moment in history still hasn’t made it to the classroom and McGuinness’ placement of historical politicians was excellent – it was interesting to actually learn more about the politicians you have only heard about on the news as a child. Members of the group particularly liked McGuinness’ turn of phrase and there were some brilliant one-liners. At times you felt that the novel had been written by a poet because there was an abundance descriptive language. This is where a few people felt the novel fell short. We felt perhaps it could have been cut to two-thirds of its current length and would still convey the same plot-lines without losing too much of the story. We agreed this was a typical problem for the first-time novelist where their debut work tends to be a bit longer than is necessary. In terms of the novel’s characters one reader noted how she never felt attached to any of the characters, something which is unusual for a novel of this length. However, another reader commented that this was exactly the point of the characterisation of the narrator and his side-kick Leo. Emotion does not count for much when you are living in a communist state and everybody you know is recording your every word and movement. We felt this was an engaging account of an important part of history, one which will probably have even more relevance in years to come. Parts of the novel were witty and I particularly like the reference to the Berlin Wall-scaling David Hasselhoff, the ‘strutting, plasticated showbiz clown with a mullet’. The ‘The Last Hundred Days’ succeeds in terms of a snapshot of a particular moment in history. However, some readers questioned its novel form, wondering if it would be best described as a travelogue. This led us to discuss to what extent is the book autobiographical? We all agreed that we would like find out if Patrick McGuinness has another novel in the pipeline, historical, autobiographical or not. Want to join us next month? We’re currently reading the English language translation of ‘Trials of Enoc Huws’ by Daniel Owen. We’re meeting on Wednesday 11th September at 5.30pm in Palas Print, Bangor. All of our meetings are on the second Wednesday of the month.